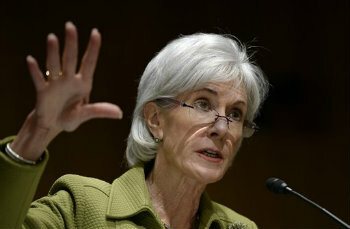 Investigators say the inspector general told Sebelius she should could drum up private donations. The U.S. Department of Health and Human Services has documents showing the HHS Office of General Counsel told Secretary Kathleen Sebelius she could ask private groups to support Enroll America. One of the five organizations Sebelius called last year – the Robert Wood Johnson Foundation – gave Enroll America $13 million after Sebelius called, according to John Dicken, a director at the U.S. Government Accountability Office. But the foundation started giving money to create Enroll America in 2010, and representatives say the 2013 grants had nothing to do with the Sebelius call, Dicken says. Another health care group, Ascension Health, gave Enroll America $1 million after Sebelius called, but they were already on Enroll America’s founding board before she called, Dicken says. Dicken talks about Sebelius efforts to round up private support for Enroll America in a summary of a GAO investigation conducted at the request of several GOP members of Congress. Many Republicans have objected to federal efforts to press private groups to support Enroll America. HHS documents show Sebelius called the chief executive officers of five organizations – the Robert Wood Johnson Foundation, H&R Block, Ascension Health, Johnson & Johnson, and Kaiser – on behalf of Enroll America, Dicken says. Sebelius asked the general counsel’s office for advice before making any of the calls, according to the GAO review. The general counsel’s office actually gave Sebelius oral assurance she could make the calls after she’d already talked to the Robert Wood Johnson CEO, Dicken says. Sebelius asked both the Robert Wood Johnson and H&R Block CEOs for donations for Enroll America, and she asked the others for non-financial support, according to the document review.